Plantation Stars may turn out to be one of my all time favorite quilts! Star abound large and small in a dance around the quilt center making your eyes dance as well. Both size stars are constructed in the same way. The block arrangement creates a great secondary pattern with the small stars forming a circular pattern around the large stars! The open space calls out for terrific quilting and the combination creates just a wonderful quilt!! All blocks use modern rotary cutting and piecing techniques. Make your quilt in any two color combination you'd like! The quilt measures 72" x 81". 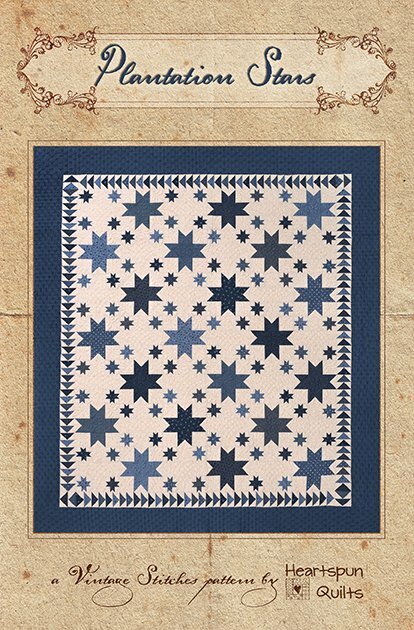 A limited number of kits are available for Plantation Stars, which includes the pattern. Click here to read more.